MoonMarble.com - Thunderbolt (formerly Police Officer) 5/8"
Bulk Marbles → Target Marbles - approx. 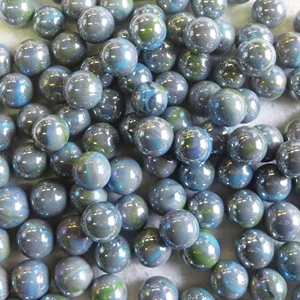 16mm or 5/8" → Fancy Varieties - 5/8" → Thunderbolt (formerly Police Officer) 5/8"
Thunderbolt (formerly Police Officer) 5/8"
Police Officer marbles have an opaque grey base with swirls of blue and green glass on the surface of each marble. They are iridized to have an extra shiny reflective surface like the surface of oil. These marbles are sold in one pound bags and approximately 250 count bags. There are approximately 80 to 90 of these 5/8" diameter marbles in a pound bag. The 250 count bag is an approximate amount and not a guaranteed quantity. Sizes may vary slightly. Warning! : Choking Hazard. This toy is a marble. Not recommended for children under 5 years.